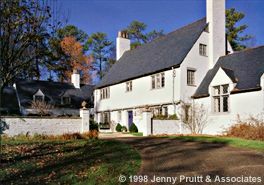 Aymar Embury II (1880-1966) was one of America's leading architects of country houses. Noted for his Long Island, N.Y., mansions, he also frequently worked in the South. In 1909, he published "One Hundred Country Houses." Buckhead is fortunate to have two of his homes: 675 West Paces Ferry Road and 3600 Northside Drive, both built for the Richardson family. Embury met the owner when he was serving in World War I in France, and 675 West Paces was inspired by the manor houses of northwestern France. As a footnote to his military service, Embury designed America's Distinguished Service Medal and Distinguished Service Cross to honor military bravery. In 1998, 675 West Paces became the heart of a new housing development, the Richardson Estate, which preserves the original home and adds 13 architecturally complimentary homes in a 14-acre wooded park.